Jennifer Larmore’s exceptional affinity with the bel canto repertoire, supported by her formidable technical armoury, has allowed Opera Rara the luxury of recording for this disc some of the most difficult vocal music of the 19th century. 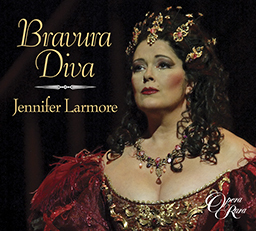 Jennifer Larmore’s exceptional affinity with the bel canto repertoire, supported by her formidable technical armoury, has allowed Opera Rara the luxury of recording for this disc some of the most difficult vocal music of the 19th century. Virtuosity, then, is the theme of this album. 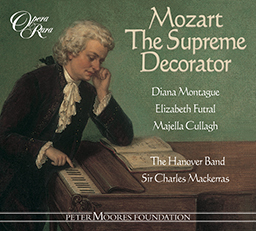 It features music written for several of the greatest singers of the early 19th century, including Carolina Bassi, Rosmonda Pisaroni, Isabella Colbran and Maria Malibran. A lot has been written about the vocal abilities of these legendary singers. The music they sang is often very florid, the drama reinforced by pyrotechnical vocal hurdles, which on paper look just this side of impossible. It’s only when you hear a singer of the calibre of Jennifer Larmore actually leaping those hurdles that you begin to understand what the fuss was all about. 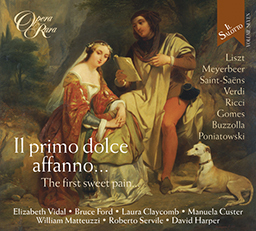 Works by Costa, Rossini, Pacini, Mercadante and Lauro Rossi are all featured on this disc. Jennifer Larmore, Majella Cullagh and Bruce Ford. London Philharmonic Orchestra, Academy of St Martin in the Fields, Geoffrey Mitchell Choir. David Parry, Antonello Allemandi, Giuliano Carella - conductors, David Harper - piano.